Keep Breathing. These words stood in bold lettering on a card I gave a close friend. She had just received some painful news and was very distressed. She told me several days later that she carried that card with her everywhere she went so she would be reminded to take a few slow, deep breaths several times a day. When we experience a threat of any kind (real or perceived), our bodies have a way of taking over. Our bodies know what to do to prepare us to survive the threat. The “threat alert center” in our brain communicates not with our problem-solving cerebral cortex but with our adrenal glands. Our adrenal glands then set in place a series of biochemical responses that cause, among other things, our heart to speed up, our blood pressure to increase, our muscles to tighten and our breathing to become fast and shallow. All of this can help us survive an immediate danger. These physical changes help us respond more quickly and more powerfully to an immediate, short-term threat. They help us fight harder and run faster. But most of life’s challenges are not short-term. Marital conflict, a child’s drug abuse, healing from early trauma or difficult diagnoses like cancer are all threats that can persist for weeks and months and even for a lifetime. As a result, many of us live in a chronic state of high alert. Many of us live as if we were under constant threat. Tense. Pressured. We need to slow down the adrenaline surges that are set off by fear. As simple as it might seem, paying attention to how we breathe has been shown to have a powerful impact on how our bodies respond to danger. Changing our breathing can be a kind of antidote to the constant stress our minds and bodies experience when we are afraid. Whether we are anxious about a life crisis or any of the hundreds of other things we might fear, the simple act of slowing our breathing can make a significant difference. We cannot control most of the changes that happen in our body when a sense of threat is present. We cannot make our heart calm or our blood pressure go down, but we can slow our breathing. With a little effort, our quick, shallow breaths can be turned into slow, deep breaths. Like my friend who carried that card with her as a reminder, we need to pay attention to our breathing from time to time and slow it down a bit. The amazing thing about this simple practice is that, when we pay attention to our breathing and begin to take some slow, deep breaths, we are sending a clear message to our bodies and brains that it is okay to relax a bit. It is like sounding the “All Clear” signal. As a result, not only does our breathing slow down but all the other physical and biochemical changes that our adrenal glands have set in motion begin to subside. It can help our heart to stop racing, our blood pressure to come down and our muscles to let go of a little of the tension they are holding. But there is more. Gently attending to our breathing not only reduces stress on our bodies, it also soothes and nurtures our minds and spirits by grounding us in the present. When we sit quietly, even for a few minutes, and pay attention to our breathing in and breathing out, slowing it down, letting the gift of oxygen flow all the way down to our belly, we quiet our wild thoughts for a time and allow ourselves to be in our body—rather than in our fears—living in this moment, one moment at a time. When I was working to heal from childhood trauma, I was often anxious. My nights were frequently disturbed by terrible dreams and my days were interrupted by flashbacks. In order to function, I began to practice times of slow, deep breathing every day. Often, I would begin my mornings with time alone to pray. These times usually started with five to ten minutes of slowing my breathing, relaxing my tense muscles and allowing myself to be in the present. Throughout the day I would take short breaks and allow myself a few more slow, easy breaths to calm my nerves. Breathing in this way became a survival tool for me. It was many years after this difficult healing work that I was diagnosed with cancer. Within a few days, I returned to the regular practice of setting aside time to slow my breathing. I again added extra time each morning to my prayer times. I would begin these times with a few minutes of slow, deep breathing. Sometimes I listened to music as I breathed in this way. Sometimes I sat in silence with my hands open in a gesture of surrender and receptivity. Often I did both. These times were sacred to me. They calmed my mind and body. They helped me to stay in the moment, and they allowed me to experience times of resting in the reality of God’s unfailing love. As we pay attention to our breathing and slow it down, we can remember that with each breath we are receiving God’s gift of life to us deeply, fully, one breath, one moment at a time, here, now, in this moment. Because this is such a simple practice, it is easy to underestimate its value. And it is easy to forget to use it on a regular basis. But when we are aware of feeling anxious or tense, we can allow our discomfort to serve as a reminder to take a few, slow, deep breaths and to plan a time in the near future when we can sit quietly for a longer period of time to attend to our breathing. 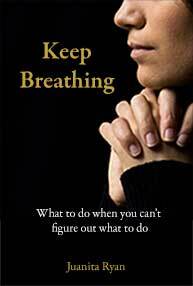 When you don’t know what to do…keep breathing. 1. What are you aware of feeling in your body right now? 2. Look at a watch or clock and practice taking six slow, easy breaths over a minute. Then continue for one more minute with this same rate of breathing as you reflect on the gift of life offered to you in each breath. 3. What was your experience as you slowed your breathing and reflected on the gift of life in each breath?